He’s probably the most culturally significant Japanese person, in international terms, in all of history. A Zen Life – D.T. Suzuki is a documentary about Daisetsu Teitaro Suzuki, Zen philosopher and one of the most influential thinkers of the 20th century. He is considered to be the person who single-handedly introduced Zen Buddhism to the West. It may well be that the publication of D.T. Suzuki’s first Essays in Zen Buddhism in 1927 will seem in future generations as great an intellectual event as William of Moerbeke’s Latin translations of Aristotle in the thirteenth century or Marsiglio Ficino’s of Plato in the fifteenth. Aside from writing books, he also traveled and lectured around the world. He influenced many of the great Western intellectual figures of the 20th century. Among those who admitted the impact of D.T. Suzuki on their work and thought are: the psychologist Carl Jung, the philosopher Martin Heidegger, the psychoanalyst Eric Fromm, the writer Jack Kerouac, the poet Allen Ginsberg, and the Catholic monk Thomas Merton. If I understand [Dr. Suzuki] correctly, this is what I have been trying to say in all my writings. he was enthusiastic… When he read what Hsu Yun said, he sometimes felt as if he himself could have said exactly this! It was just ‘it’! These talks were very pleasant, profoundly important to me—to see and experience the fact that there really is a deep understanding between myself and this extraordinary, simple man whom I have been reading for about ten years with great attention. The documentary is a vivid portrait of one of the most extraordinary intellectuals of the 20th century. It includes rare footages of D.T. 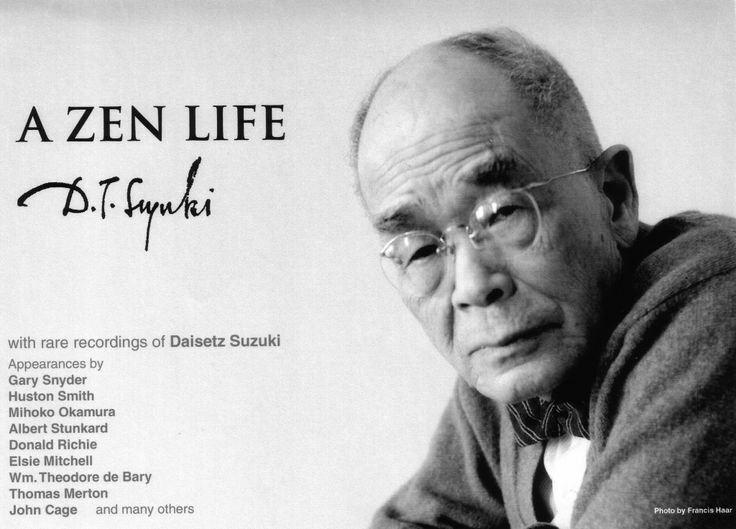 Suzuki, as well as reminiscences of people he influenced. What an interesting article. I especially was intrigued by Heidegger’s comment. That was unexpected! Well, I also was tickled by his comment about writing a hundred books about Zen, once he’d said it was impossible to describe. Coming from the West rather than the East is this review of a book about the monastery at Cluny. I thought you might be interested in it, just as history if nothing else. I found it fascinating. Thank you for posting this video. It is wonderful to view and absorb! Glad you liked it, Senan. Never thought that this small, quiet, unassuming man who is often found in his book lined study, pecking with his two fingers at his typewriter is one of the most influential thinkers of the 20th century. His jam packed lectures at the classrooms of Columbia University in New York during the 50’s ignited the start of the West’s widespread interest in Zen Buddhism. To my mind the secret of his influence is not in his erudite books and lectures. It was the way he lived his life. Life, according to Zen, ought to be lived as a bird flies through the air, or as a fish swims in the water. He embodied this, living his life with the freedom and spontaneity of the birds of the air, and the fish in the sea. Indeed, Linda, it’s quite interesting that one of the original thinkers of the West would identify his thought with that of D.T. Suzuki, a Zen philosopher. Quite fascinating, as far as I’m concerned. However, for me, this just shows how much the West has lost contact with its own mystical and contemplative tradition. It does not bring ‘news’ which the receiver did not already have, about something the one informed did not yet know. What Zen communicates is an awareness that is potentially already there but is not conscious of itself. Zen is then not kerygma but realization, not revelation but consciousness, not news from the Father who sends his Son into this world, but awareness of the ontological ground of our own being here and now, right in the midst of the world. God is the ground of our being. Personally, it’s an object lesson on how money and power can corrupt even monastic institutions. Fortunately, though, once this happens reform movements spring up to recover what’s essential to the monastic and contemplative life. My own favorite monastic order, the Trappists, is a result of 2 major reforms in the Benedictine order. The first one in the 10th century (probably in almost the same time as the Cluniac reform). And the 2nd one, in the 17th or 18th century, in a monastery in a place called La Trappe in France. Hence, their informal name: Trappists. I agree, it’s a beautiful documentary about one of the most remarkable persons in the 20th century. A film worth watching over and over again, as we try to grasp and absorb the life and thought of D.T. Suzuki. Count me among those unfamiliar with Suzuki’s work, unfortunately. To be endorsed by the quality of thinkers mentioned in this piece is quite a credit to him.